"If I say so myself, I am muy foxy!" When novice P.I. Geri Sullivan first heard her adopted Chihuahua talk, she thought she'd gone barking mad. 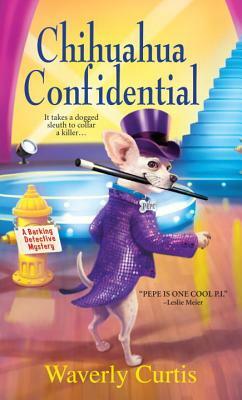 But it turns out Pepe is a savvy sleuth--and if he has his way, he'll soon be a bone-a-fido celebrity, too, as Pepe and Geri are Hollywood-bound to star in the reality show Dancing With Dogs. So far, so bueno. Then Nigel St. Nigel, the judge everyone loves to hate, becomes the judge someone wanted dead. Pepe and Geri are hot on a killer's heels but between perfecting the paso doble and protecting Pepe's Pomeranian lady love, both have their paws full. If Pepe's new status as a Beverly Hills Chihuahua goes to his head, it may be the last waltz for Geri's crime-biting compadre. . .